What Day Of The Week Is May 16? 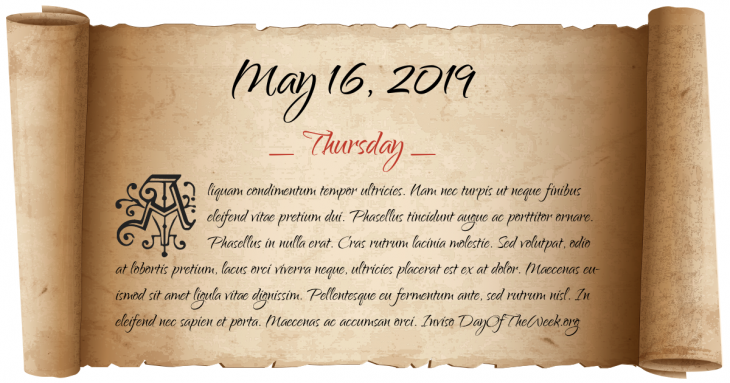 May 16, 2019 is the 136th day of the year 2019 in the Gregorian calendar. There are 229 days remaining until the end of the year. The day of the week is Thursday. The U.S. Congress eliminates the half dime coin and replaces it with the five cent piece, or nickel. President Andrew Johnson is acquitted in his impeachment trial by one vote in the United States Senate. The first ever Lamar Hunt U.S. Open Cup final is played. Brooklyn Field Club defeats Brooklyn Celtic 2-1.
Who were born on May 16?